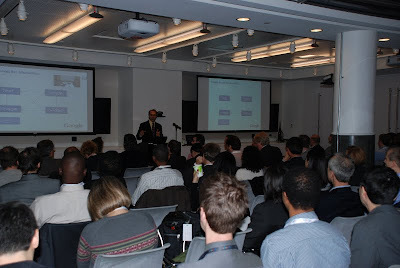 at Google's office in New York, 80 United Nations delegates from more than 20 UN agencies, met with various Google product teams to explore how Google's wide array of products and services can further the UN mission and help foster innovation and new thinking. Google's Alfred Spector and the U.N.'s Choi Soon-hong, the first Chief Information Technology Officer (CITO) for the United Nations, both gave inspirational keynote addresses. We discussed products and tools including Google Earth & Map Maker, Flu Trends, visualization APIs, public data search, and much more. One consistent theme was the desire to increase momentum in efforts to collaborate and share information publicly in ways that will help all U.N. agencies and other humanitarian organizations meet new challenges in an increasingly networked society. This same theme was echoed in the workshop that Google hosted in Washington DC with over 20 international humanitarian organizations last month. Google's Map Maker Product Manager Lior Ron made two exciting announcements at the event. On the heels of our recent announcement of the Latin America Mapping competition, Google will be launching a global mapping competition in partnership with UNICEF. The competition will run December 15 - January 31, and Google will donate $50k to UNICEF that will go toward programs that empower young people through technology in the home country of the competition winner. The other announcement is that Map Maker data for Southeast Asia is available for download for non-commercial uses. The 9 Southeast Asian countries where Map Maker is open for editing that are now included in the Map Maker download program are Brunei, Cambodia, Laos, Malaysia, Myanmar (Burma), Papua New Guinea, Philippines, Timor-Leste, and Vietnam. The Map Maker download license is available for non-profits, government agencies, and individuals to create and enhance their own non-commercial map-related projects as long as attribution is given back to Map Maker. We started this data download program with the Africa dataset over the summer. See our new Map Maker partner showcase page to learn how several United Nations agencies have used Map Maker data to further their humanitarian missions. At an event organized jointly by the United Nations and Google at Google's office in New York, 80 United Nations delegates from more than 20 UN agencies, met with various Google product teams to explore how Google's wide array of products and services can further the UN mission and help foster innovation and new thinking. Google's Alfred Spector and the U.N.'s Choi Soon-hong, the first Chief Information Technology Officer (CITO) for the United Nations, both gave inspirational keynote addresses. We discussed products and tools including Google Earth & Map Maker, Flu Trends, visualization APIs, public data search, and much more.